Quinn has ambitions of attracting state funding for his proposal, but he must first meet with the FAI. File photo of Niall Quinn. 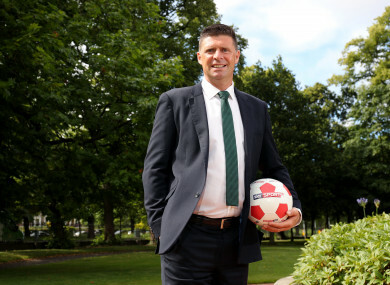 MINISTER OF STATE for Department of Transport, Tourism and Sport Brendan Griffin has said that Niall Quinn’s proposal for an independent League of Ireland would have to first involve the FAI prior to going before his department. Quinn spoke at a public meeting in Dublin on Monday entitled ‘Making Politics Work For Football’ at which he outlined his ambition to attract government funding for plans for the League of Ireland, which is predicated on the clubs splitting from the FAI. The former Irish striker has received support from politicians and leaders in education for the proposal, which centres on an independent league maximising revenue through a beefed-up commercial arm along with the building of academies at each club to keep young players at home for longer. Quinn and his backers aim to formalise the plan within the coming months in the hope of attracting government funding. “I think there is a way to make it attractive and if that happened I think that government would be absolutely ideal [to invest]“, said Quinn on Monday. Quinn told the Irish Independent he has plans to meet with the FAI over the proposal, although has yet to do so. Minister Griffin told The42 that Quinn’s proposal is first a matter for the FAI rather than the Department of Sport. I am always interested in new ideas, but the FAI are the National Governing Body of the sport, and are tasked with all matters relating to football in this country. It is a matter for that governing body to deal with and to meet with Niall Quinn. “It’s not for the Department of Sport to deal with that sport’s internal issues and it is a matter for the FAI. Separately, Minister Griffin welcomed the imposition of eight-year term limits on the FAI Board, a move ratified at an FAI EGM on Monday. The Department’s ten-year sports policy, published last year, included a governance code with which the FAI came into line with the imposition of term limits. Under the new agreements, Honorary Secretary Michael Cody and Honorary Treasurer Eddie Murray are not eligible for re-election while four further members of the FAI Board will see their terms finished within the next four years. The term limits do not apply to Chief Executive John Delaney as he is a hired employee rather than an elected member. When asked if this satisfied his department, Minister Griffin refused to comment. Email “Sports minister Griffin says Niall Quinn's proposal for Irish football is a 'matter for the FAI' ”. Feedback on “Sports minister Griffin says Niall Quinn's proposal for Irish football is a 'matter for the FAI' ”.